A recent Australian study on golf injuries found the overall incidence rate of golf injury was 15.8 injuries per 100 golfers in a one-year period. Recurrent injuries were most common, while injuries were more likely to occur over time as opposed to an acute onset. The lower back was the most common injury site (18.3%), closely followed by the elbow/forearm (17.2%), foot/ankle (12.9%) and shoulder/upper arm (11.8%). A total of 46.2% of all injuries were reportedly sustained during the golf swing and injury was most likely to occur at the point of ball impact (23.7%), followed by the follow through (21.5%). 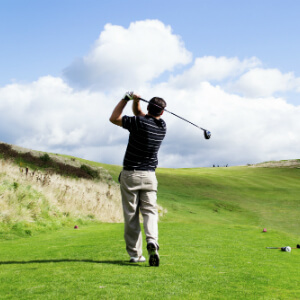 The amount of game play and the last time clubs were changed were significantly associated with the risk of golf injury, while other factors such as age, gender, handicap, practice habits and warm-up habits were found to be not associated with golf injury. For further information on golf-related or any other golf conditioning matter, please contact Synergy Healthcare today.